Parents, there's only 1 DAY REMAINING to re-enroll your students for the 2019-2020 school year! 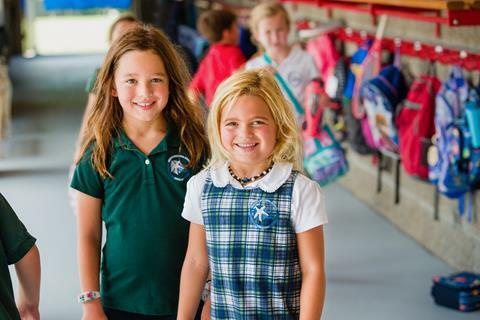 Remember that you can complete the re-enrollment process online through RenWeb. You should have received an Online Enrollment email notification earlier this month from the Admissions Office to begin the re-enrollment process for your student. 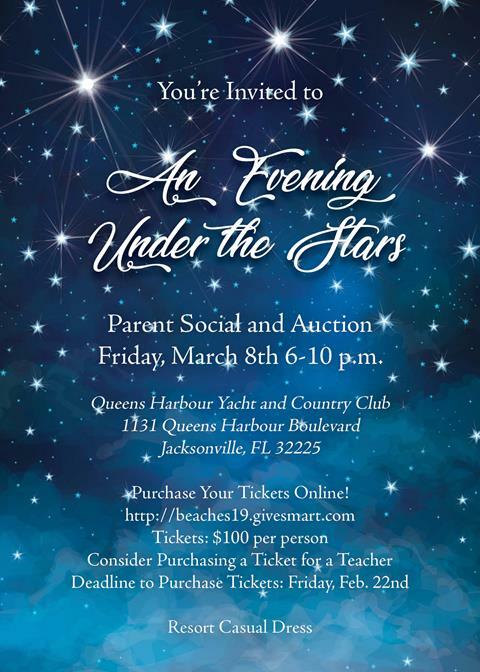 Purchase tickets to the most exciting event of the year as we gather for the BES Parent Social and Auction at Queens Harbour Yacht and Country Club on Friday, March 8th from 6-10 p.m. The event includes a gourmet dinner, drinks, and incredible silent and auction items. 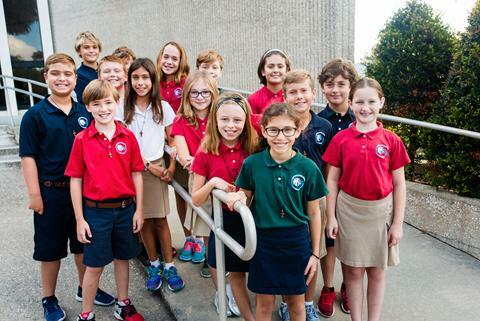 Proceeds benefit Beaches Episcopal School. Consider purchasing a ticket for a teacher to show your gratitude for them. The deadline to purchase Parent Social tickets is Friday, Feb. 22nd, so act now to guarantee your spot! Join the fun of fitness by participating in the BES February Fitness Challenge! Follow this calendar of exercises to complete the challenge. Each week that you complete all of the exercises, cut out the raffle ticket on the bottom of the page, fill out your name, teacher, and have it signed by your parents. Then, turn the ticket in to Mrs. Novak or the front desk on the following Monday to be entered into the raffle drawing for that week! There will be one winner per week that will be announced on the Wednesday Morning announcements. Students that win will choose a PE activity or game (with approval) for all grade levels to play during PE class. Students that complete all 5 weeks will be entered into a Grand Prize Drawing. Have fun being fit! The BES girls volleyball team won their game against San Jose Episcopal Day School in dramatic fashion on Thursday, Jan. 31st. We congratulate them on their teamwork and fantastic efforts to win the game. We can't wait to see what the rest of the season holds! The JV and Varsity football teams continue to improve each and every week. We applaud their teamwork and determination to grow as players and as a team. Our Lost and Found container is close to overflowing, so we will be bringing it to the Flag Ceremony this Friday to allow our parents and students to identify and claim any items they may have lost throughout the year. Moving forward, we ask parents to label all outerwear with your child's name so that we can quickly return lost items to their owners. Thank you for your help in this regard. The Brotherhood of St. Andrew's Annual Shrimp Dinner is Saturday, March 2, 5:30-8:30 p.m. in Stormes Hall. Piano Man, Gene Nordan will provide the entertainment. Prepaid reservations ($20 per person) are required. Reservation forms are available at the McCormick Hall reception desk. Proceeds from this event go toward the Brotherhood’s outreach efforts, international, national, and local. 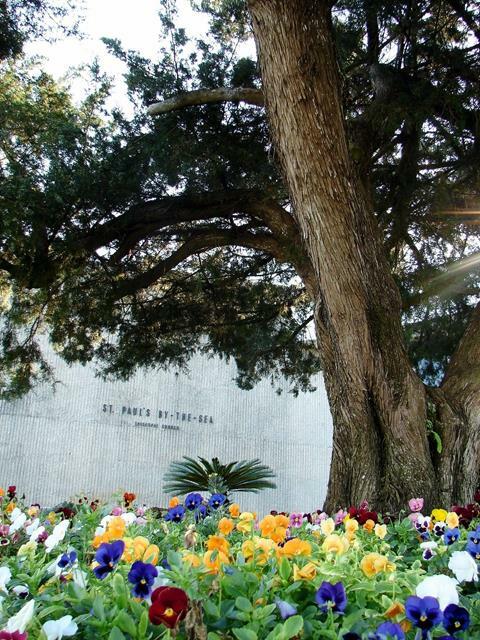 Eat, drink, and be happy, for Lent begins the next Wednesday. Mark your calendar: Shrove Tuesday is March 5th. Tickets will be available soon for a delicious dinner which features a pancake bar and red beans and rice with all the fixins!